March 6, 7, 8, 9 & 10, 1984. DT wrote; “I have been an enthusiastic admirer of Noël Coward’s work for nearly forty years, so it has given me much pleasure and an exciting challenge to have the opportunity of directing one of his most popular plays. Blithe Spirit was written in six days during a holiday in North Wales in 1941 – hardly a line has been altered since. The master wrote it, as he says, as a result “of an idea for a light comedy which had been rattling at the door of my mind, and I thought that the time had come to let it in and show it a little courtesy”. The ‘idea’ when it was first performed later in 1941 ran for 1997 performances! Despite the fact that over forty years have elapsed, I think it is still tremendous fun and splendid ‘theatre’, which I hope you will all enjoy. We welcome, Karen Mulholland in her first rôle in a ‘straight’ play with the senior company, although she is well-known as a longstanding member of the Young Wick group and for her performances in Wick musicals. This play also sees Sheila Wright in her first major rôle since Arsenic and Old Lace and we are very pleased to have her ‘treading the boards’ again. The remainder of the cast make regular appearances and the majority have worked with me in previous productions. They are obviously gluttons for punishment! THE Theatre Company are anxious to hear from anyone who can give them glasses and vases. They need several glasses and vases for their production of Noël Coward’s Blithe Spirit. But there is no chance of the glass being returned, as it is smashed on stage each night. The production, directed by Douglas Tucker, is to be staged at The Barn Theatre, Southwick from Wednesday to Saturday [March 7 – 10] at 7.45p.m. This latest production means a spirited rôle for Miranda Bowen – she plays the ghost. Teaming up as husband and wife are Ronald Cheesman and Frances Moulton, as Dr and Mrs Bradman. Another couple will be Neil Shephard and Joan Bearman as Charles and Ruth. Pictured from left to right, Sheila Wright, Neil Shephard, Karen Mulholland and Miranda Bowen in a scene from Wick Theatre company’s production of Blithe Spirit. RIGHT from the opening curtain one could sense Wick Theatre Company’s production of Blithe Spirit was going to be a winner. Two and a half hours of pure enjoyment followed as the cast glided smoothly and faultlessly through Noël Coward’s delightful comedy. The production at Southwick’s Barn Theatre could aptly be described as spirited – but in more ways than one. Blithe Spirit was certainly tremendous fun to watch and the small and talented cast obviously enjoyed every line as much as the audience did. But it was Sheila Wright who stole the show in the rôle of then eccentric medium Madame Arcati. Her characterisation, from the affected airs to the string of beads around her neck, added up to a riveting performance. Well known for her appearances with young Wick, Karen Mulholland made an impressive debut with the senior company as the ‘fleet of foot’ maid Edith. Completing the cast in the smaller but no less important parts, was Ronald Cheesman as Dr Bradman and Frances Moulton as his wife. The final word of praise must go to all those who worked long and hard back-stage, including director Douglas Tucker and those responsible for the special effects – after all paintings don’t fall off walls on their own, do they? 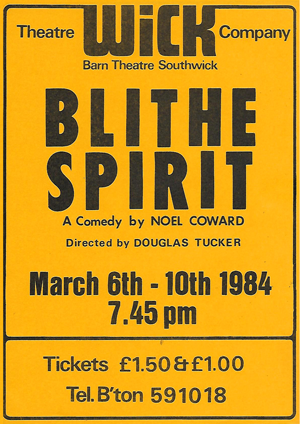 I HAD thought the Noël Coward epidemic was over, but there was a fresh outbreak last week in Southwick when the Wick Theatre Company presented Blithe Spirit. Neil Shephard was in good form as Charles Condomine variously bewildered, angered and enchanted by the arrival of the ghost of his first wife Elvira. That two-ways spirited lady was Miranda Bowen whose elegant gracefulness of movement was admirably suited. I did find Sheila Wright’s Madame Arcati rather disappointing. She was too ordinary. I appreciate that one must beware of regarding Margaret Rutherford as the definitive Madame Arcati, but I have seen Arcatis that infused their own personality whilst maintaining the essentially bizarre nature of the character. This is to draw a veil over the occasion at Saltdean some years ago when, owing to the illness of the actress concerned, Paul DeVile played Madame Arcati in drag. An unforgettable experience.! Set construction and stage management teams had done excellent work on table rappings and the poltergeist finale in which ornaments, pictures, candlesticks, curtains and gramophone take on a life of their own.